With all the information that is available on the World Wide Web, there is great demand for data mining techniques and sentiment analysis is a particularly popular domain, both in business and research. Sentiment analysis aims to determine the sentiment value, often on a positive–negative scale, for a given product or service based on a set of textual reviews. As fine-grained information is more useful than just a single overall score, modern aspect-based sentiment analysis techniques break down the sentiment and assign sentiment scores to various aspects of the product or service mentioned in the review. 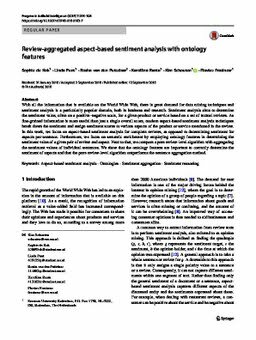 In this work, we focus on aspect-based sentiment analysis for complete reviews, as opposed to determining sentiment for aspects per sentence. Furthermore, we focus on semantic enrichment by employing ontology features in determining the sentiment value of a given pair of review and aspect. Next to that, we compare a pure review-level algorithm with aggregating the sentiment values of individual sentences. We show that the ontology features are important to correctly determine the sentiment of aspects and that the pure review-level algorithm outperforms the sentence aggregation method.